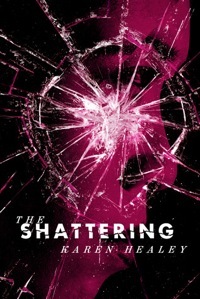 The Shattering is not a book about magic. Oh sure, there’s magic in it, and that’s what sets the plot in motion. But at its heart, The Shattering is about things that are much more raw and real: the grieving process. Secrets. Bullying. The complicated ways we relate to the places we’re from. Summer flings. Friendship. In fact, for a significant chunk of the book I wasn’t 100% sure there was going to be any magic, and I wouldn’t have minded in the least if there hadn’t been, since everything else was handled so deftly – except that I wouldn’t have been able to tell you guys about it here. It’s incredibly gripping – I picked it up while sitting by the pool on vacation in Florida, and the next time I looked up the sun was setting and it was time to get ready for dinner. It’s also a little creepifying – don’t read it right before bed, maybe. The characters are wonderfully complex and feel like real teenagers; even when they’re saying horrible things or being petty or cruel, they still read as decent, complicated people. As with Karen’s previous book, Guardian of the Dead, The Shattering is consciously diverse and explicitly addresses issues of race, gender, and sexuality throughout. It also draws strongly on its New Zealand setting and references Samoan and Maori traditions and culture. All of that is basically super great. It is, unsurprisingly, pretty sad – after all, it’s about three teenagers whose brothers have just died. I was in tears by the end, and I’m sure I’m not the only one. Did I mention? It’s really freaking good. While Guardian of the Dead was excellent, The Shattering is nearly flawless. My one teeny tiny quibble is that while the book spends a lot of time on its heterosexual love triangle, I would have liked to see Keri, who is gay, have at least a hint of a love life, even a one-sided one. Still, as she’s the primary narrator, she doesn’t exactly get short shrift, story-wise (and there is a mention of her dating at the very end). All in all, The Shattering gets the full five cupcakes. Bring on the next book! This entry was posted on Thursday, January 5th, 2012 at 9:54 am and is filed under 5 Cupcakes, Contemporary/Urban Fantasy, Horror. You can follow any responses to this entry through the RSS 2.0 feed. You can leave a response, or trackback from your own site.